‘Sing of the Maiden that is matchless’: wonder restored - Review by Robert Ombres O.P. Home Page Review by Aidan Nichols O.P. This is a wonderful book. The reader will do well to pause for a while before opening it, and meditate on the cover picture, The Nativity at Night by Geertgen tot Sint Jans. 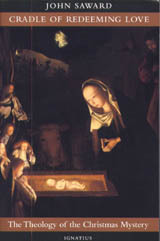 The crib scene is, at the same time, familiar and distant, clear and obscured, earthed and supernatural. Inside the book, the painting serves to illustrate the littleness of immensity involved in the Incarnation, and it is complemented by reference to the prophet Isaiah as used by St Paul, and to the writings of Guerric of Igny, Bonaventure and Aquinas. From all this, we begin to get a measure of Professor John Saward’s method and accomplishment. There is much that is unusual about this book. As a contemporary full-scale systematic exposition of the doctrine of Christmas by a Catholic theologian it is already a rarity, but it has other unusual features. It is rooted in Scripture, to the point that a separate index of biblical references is needed, yet it does not rely on modern commentaries as we might expect. John Saward has deliberately and extensively drawn on the Church’s doctors, mystics and poets, especially on saints, and pre-eminently on St Thomas Aquinas. He also gives liturgy its weight. But, chiefly, he wants to state the Christmas dogma, the objective and divinely revealed truth of the nativity of Christ “as proclaimed by his infallible and immaculate Bride”. A phrase such as this captures the spirit of the book and its unusual tone. With intellectual audacity, and not without its problems, John Saward proposes a now unfamiliar appropriation of the Bible. Reflecting and assembling texts within the praying and teaching Church, he sets out a coherent account of Christmas that is doctrinally sound yet imaginative and spiritually nourishing for the believer. He takes the risk, in our hesitant postmodern times, of simply talking and talking simply about God in his human infancy, the Creator in the cradle. As it turns out, such simplicity is not completely attainable in a work of sustained scholarship that tackles a good number of problems. There are many complex and technical passages, unavoidably so if a correct understanding is to be achieved of doctrines that are subtle and controverted. Take the chapter on Mary as mother and maiden. The author tells us this chapter will “sing of the Maiden that is matchless”, approaching Mary in faith, with the quietness of reverence. Candidly and revealingly, John Saward then adds that in places a more “martial” note will be struck. And it is. There can also be an emphatically didactic style, recalling that Professor Saward has taught and still teaches theology with distinction in various countries. In this chapter, then, we find hymn, carol, heightened prose, liturgy and scriptural imagery together with an exposition of the seven arguments in favour of the fittingness of the Virginal Conception, and the five arguments for Mary’s virginity in giving birth to Jesus. The book has an introduction and conclusion, framing six chapters. The opening chapter on the mysteries of the life of Christ sets the overall perspective. The other chapters deal with the nature of Christ’s birth; the person of Mary his mother; the purpose for which Christ was born; the time and place of his birth; and finally the newborn Christ’s manifestation. Even a summary shows just how much is covered but, at a fundamental level, more should have been said, and said systematically, about the relationship of Christmas to Easter. The accomplishment of this book is in its intellectual vigour, its wide-ranging scholarship, and its thorough doctrinal coverage of many aspects of the Christmas mystery. It is also written with an air of wonder. A wonder not only as expressed by Dickens and Chesterton but as actually experienced at Christmas celebrations, multiplied for John Saward by sharing in the experience of his own children. Most deeply, it is a believer’s wonder at the lavish, cosmic and amazing generosity of God towards us. By the nativity of Christ, God and humans and angels and animals begin to recover a lost harmony. Argument, debate and polemic have a place in theology, and they are found in this book’s concern to be reliably precise. John Saward, however, has adopted a method meant mainly to propose anew a neglected approach to the mysteries of faith in Christ, one responsive to the beauty of truth. In the end, he wants us to be enchanted by Christmas. This review originally appeared in The Tablet and is reproduced with permission.